Wisdom of Life. : How To retire? 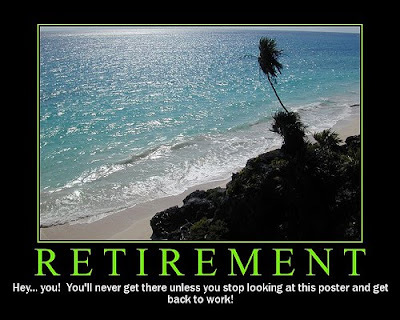 This is a MUST READ for those about to retire, and also for those who have retired, no kidding - the BEST ADVICE EVER !!! Auther..one who has a rich heart to share.. Unknown!!! I retired in year 2000 at age 52. I am now 61, thus I can claim that I got more experience at retirement than most! I thought I should share my experience with mariners because I have seen too many friends and neighbours who became so bored that they have become a nuisance to their spouse and children and to others! A few of them have solved the problem by going back to work. They were able to do so because they have a skill/expertise that is still in demand. The rest (and many are my neighbours) live aimlessly or are waiting to die - a very sad situation, indeed. When asked, "What would you be doing during your retirement?" Some replied, "I will travel and cruise and see the World". The golfers replied, "I can golf every day." Most could not because they are no longer fit to play well enough to enjoy the game. Those who could, need to overcome another hurdle - they need to the find the "kakis" to play with them. Most could not find others who share their favourite game and playing/singing alone is no fun. AND when they do find them, a few of them found that they are NOT welcomed like my obnoxious neighbour whom everyone avoids. I know of one guy who fell asleep after a few pages and ended up napping most of the time! He discovered that he did not like to read after all. We do change and we may not enjoy the hobbies we had. Routine Activities To Fill Your Week. For most people, your routine work activities are planned for you or dictated by others and circumstances. When you retire, you wake up to a new routine - one that you yourself have to establish as nobody else would do it for you! a) One weekly physical sport - you need to keep fit to enjoy your retirement. If you are the non-sporty type, you should fire your maid and clean your home without mechanical aids. Dancing and baby-sitting are good alternatives. b) One weekly mind stimulating activity - e.g. writing, studying for a degree, acquiring a new skill, solving problems or puzzles, learn or teach something. You need to stimulate your mind to stay alive because the day you stop using your brain is the day you start to die. c) One weekly social activity - choose one involving lots of friends/neighbours. Get yourself accepted as a member to at least 3 interests groups. Unless you prefer to be alone, you do need friends more than ever as you get older and less fit to pursue your sport. taken in this life. It's good to leave some kind of legacy. With 4 weekly activities, you got 4 days out of 7 covered. The remaining 3 days should be devoted to family related activities. In this way, you maintain a balance between amusing yourself and your family members. Any spare time should remain "spare" so that you can capitalise on opportunities that come your way like responding to an unexpected request to do a job or to take advantage of cheap fares to see places or to visit an exhibition. sure MM Lee's brain works overtime. He's 80+ and still going strong. In "Today" you would have read of 2 inspiring oldies. One is a granny who learned to play the guitar at age 60 to entertain her grandchildren. She's 70+ today and those grandchildren have grown to play with her. Another is an Indian radiologist who on retirement, qualified as an acupuncturist. He's age 77 and still offers his services (by appointment only) including free ones to those who have no income. I guarantee you that they are happy people who discovered a "2nd wind" to take them to the sunset with a smile on their faces. They require your will to do something useful with the rest of your life, a mindset change and the discipline to carry it through. Despite your busy routine, you will at times be bored. Then it's time to turn to your Bucket List. Your bucket list contains a list of things to do before you kick the bucket. They are not routine and are usually one off activities. You need them to have something to look forward to. These include anniversaries, trips (and pilgrimages), visits to friends and relations abroad, re-doing your home, tending conferences (related to your hobbies), acquiring a new set of expertise. 4 such activities that are spaced our quarterly would be ideal. You do not want to get up on a Monday and wonder what to do each week, therefore identify your set of weekly routine activities now and try them out to confirm that they are the activities that you will be looking forward to doing each week, week after week. You bucket list of "rewards" or "projects" or"challenges" is needed to help you break away from the routine thereby make live worth living.